At Allure Salon, you'll find a welcoming atmosphere with a spirited buzz of creative artists that love what they do. Fresh perspectives and expert eye connect in a place that exudes warmth, humor and style. We hold high attention to individual tastes and that is apparent within our staff and our clientele. 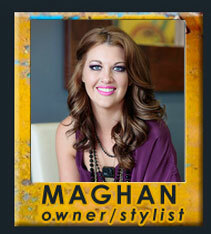 Match with a professional stylist that will help you define your personal image. Self expression is a work of art and we want to showcase the beauty you have inside & out! Our expertise combined with the unique services and techniques we offer sets us apart from your average hair salon.